, a political and infidel writer of great notoriety, was born in 1737, at Thetford, in Norfolk. His father was a staymaker, a business which he himself carried on during his early years at London, Dover, and Sandwich. He afterwards became an exciseman and grocer, at Lewes in Sussex; and, upon the occasion of an election at Shoreham, in 1771, is said to have written an election song. In the following year he wrote a pamphlet, recommending an application to parliament for the“increase of the salaries of excisemen; but, for some misdemeanours, was himself dismissed from his office in 1774. 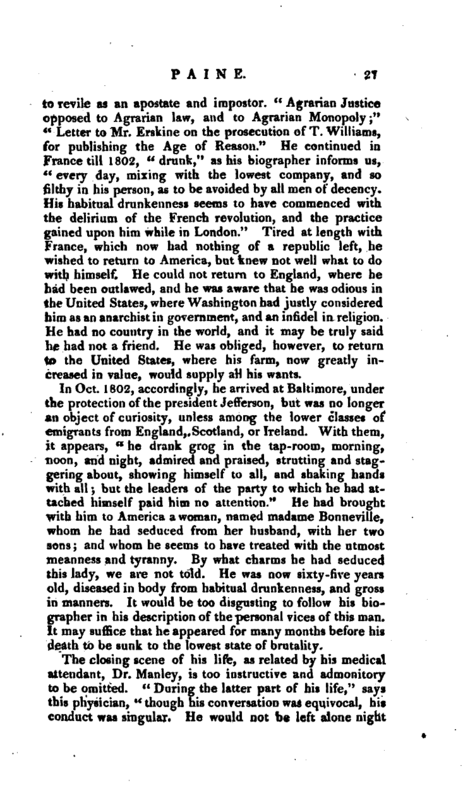 In the mean time, the ability displayed in his pamphlet attracted the notice of one of the commissioners of excise, | who sent him to America, with a strong recommendation to Dr. Franklin, as a person who could be serviceable at that time in America. What services were expected from him, we know not, but he arrived at a time when the Americans were prepared for the revolution which followed, and which he is supposed to have promoted, by scattering among the discontented his memorable pamphlet, entitled” Common Sense." 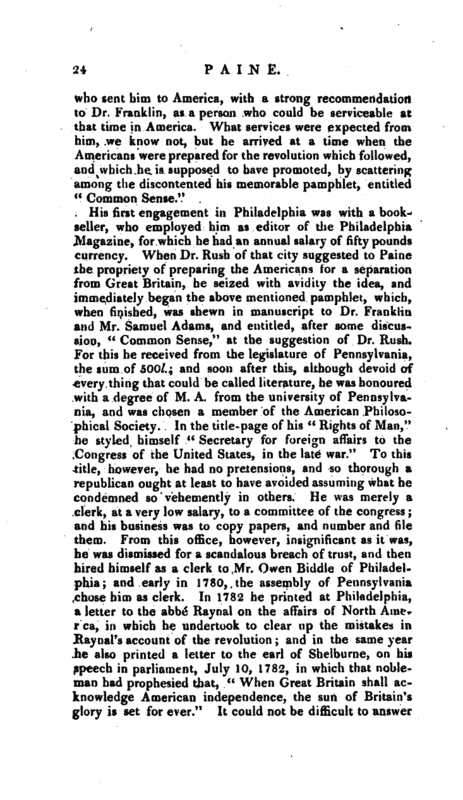 His first engagement in Philadelphia was with a bookseller, who employed him as editor of the Philadelphia Magazine, for which he had an annual salary of fifty pounds currency. When Dr. Rush of that city suggested to Paine the propriety of preparing the Americans lor a separation from Great Britain, he seized with avidity the idea, and immediately beg^n the above mentioned pamphlet, which, when finished, was shewn in manuscript to Dr. Franklin and Mr. Samuel Adams, and entitled, after some discussion, “Common Sense,” at the suggestion of Dr. Rush. For this he received from the legislature of Pennsylvania, the sum of 500l. ; and soon after this, although devoid of every thing that could be called literature, he was honoured with a degree of M. A. from the university of Pennsylvania, and vvas chosen a member of the American Philosophical Society. 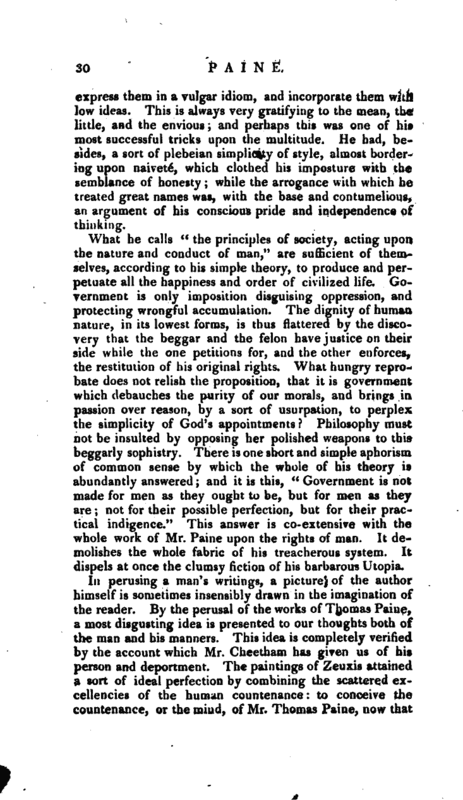 In the title-page of his “Rights of Man,” he styled himself “Secretary for foreign affairs to the Congress of the United States, in the late war.” To this title*, however, he had no pretensions, and so thorough a republican ought at least to have avoided assuming what he condemned so vehemently in others. He was merely a clerk, at a very low salary, to a committee of the congress; and his business was to copy papers, and number and file them. From this office, however, insignificant as it was, he was dismissed for a scandalous breach of trust, and then hired himself as a clerk to Mr. Owen Biddle of Philadelphia; and early in \1&0, the assembly of Pennsylvania chose hiii) as cierk. fn 1782 he printed at Philadelphia, a letter to the abbé Raynal on the affairs of North Amer ca, in which he undertook to clear up the mistakes in Raynal’s account of the revolution; and in the same yer he also printed a letter to the earl of Shelburne, on his speech in parliament, July 10, 1782, in which that nobleman had prophesied that, “When Great Britain shall acknowledge American independence, the sun of Britain’s glory is set for ever.” It could not be difficult to answer | such a prediction as this, which affords indeed a humiliating instance of want of political foresight. Great Britain did acknowledge American independence, and what is Great Britain now? In 1785, as a compensation for his revolutionary writings, congress granted him three thousand dollars, after having rejected with great indignation a motion for appointing him historiographer to the United States, with a salary. Two only of the states noticed by gratuities his revolutionary writings. Pennsylvania gave him, as we have mentioned, 500l. currency; and NewYork gave him an estate of more than three hundred acres, in high cultivation, which was perhaps the more agreeable to him, as it was the confiscated property of a royalist. lu 1787 he came to London, and before the end of that year published a pamphlet on the recent transactions’ between Great Britain and Holland, entitled “Prospects on the Rubicon.” In this, as may be expected, he censured the Cneasures of the English administration. He had long cherished in his mind a most cordial hatred against his native country, and was now prepared in some measure for that systematic attack on her happiness which he carried on, at intervals, during the remainder of his life. 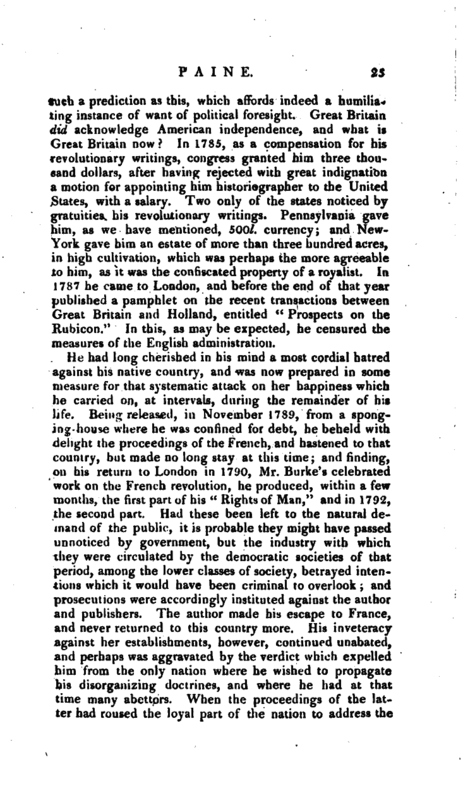 Being released, in November 1789, from a sponging-house where he was confined for debt, he beheld with delight the proceedings of the French, and hastened to that country, but made no long stay at this time; and finding, on his return to London in 1790, Mr. Burke’s celebrated work on the French revolution, he produced, within a tew months, the first part of his “Rights of Man,” and in 17.‘)2, the second part. Had these been left to the natural demand of the public, it is probable they might have passed unnoticed by government, but the industry with which they were circulated by the democratic societies of that period, among the lower classes of society, betrayed intentions which it would have been criminal to overlook; and prosecutions were accordingly instituted against the author and publishers. The author made his escape to France, and never returned to this country more. His inveteracy against her establishments, however, continued unabated, and perhaps was aggravated by the verdict which expelled him from the only nation where he wished to propagate his disorganizing doctrines, and where he had at that time many abettors. When the proceedings of the latter had roused the loyal part of the nation to address the | throne in behalf of our constitution, Paine published “A Letter to the Addressers,” the object of which was to procure a national convention in contempt of the parliament. This likewise was circulated by his partizans with no small industry. In the mean time, although ignorant of the French language, he was chosen a member of the French convention, and in consistency with his avowed malignity, gave his vote for a declaration of war against Great Britain. His adopted country, however, was not very grateful for his services, for when Robespierre gained the ascendancy, he sent Paine, with that mad enthusiast Anacharsis Cloots, to prison at the Luxemburgb, and Paine narrowly escaped being guillotined, amidst the hundreds who then underwent that fate, or were murdered in other ways. His subsequent publications were “The Decline and Fall of the English system of Finance;” a most impudent letter to general Washington, whom he had the ingratitude | to revile as an apostate and impostor. *‘ Agrarian Justice opposed to Agrarian law, and to Agrarian Monopoly;“f( Letter to Mr. Erskine on the prosecution pf T. Williams, for publishing the Age of Reason.” He continued in France till 1802, “drunk,” as his biographer informs us, “every day, mixing with the lowest company, and so filthy in his person, as to be avoided by all men of decency. His habitual drunkenness seems to have commenced with the delirium of the French revolution, and the practice gained upon him while in London.” Tired at length with France, which now had nothing of a republic left, he wished to return to America, but knew not well what to do with himself. 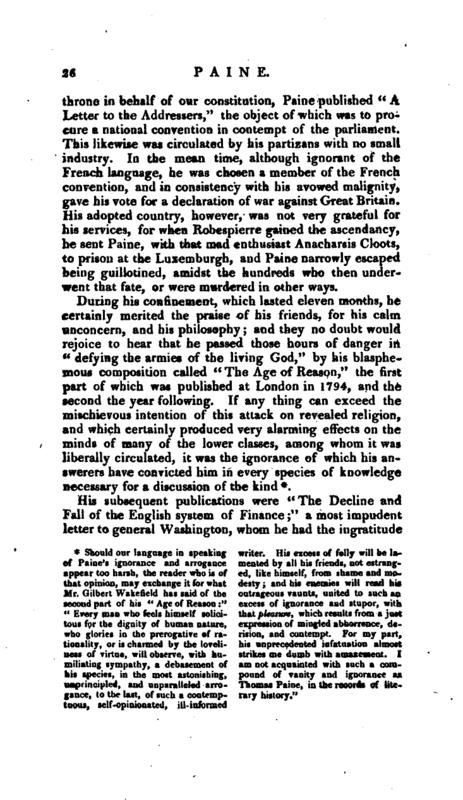 He could not return to England, where he had been outlawed, and he was aware that he was odious in the United States, where Washington had justly considered him as an anarchist in government, and an infidel in religion, He had no country in the world, and it may be truly said he had not a friend. He was obliged, however, to return to the United States, where his farm, now greatly increased in value, would supply all his wants. In Oct. 1802, accordingly, he arrived at Baltimore, under the protection of the president Jefferson, but was no longer an object of curiosity, unless among the lower classes of emigrants from England, Scotland, or Ireland. With them, it appears, “he drank grog in the tap-room, morning, noon, and night, admired and praised, strutting and staggering about, showing himself to all, and shaking hands with all; but the leaders of the party to which he had attached himself paid him no attention.” He had brought with him to America a woman, named madame Bonneviile, whom he had seduced from her husband, with her two sons; and whom he seems to have treated with the utmost meanness and tyranny. By what charms he had seduced this lady, we are not told. He was now sixty-five years old, diseased in body from habitual drunkenness, and gross in manners. It would be too disgusting to follow, his biographer in his description of the personal vices of this man. It may suffice that he appeared for many months before his death to be sunk to the lowest state of brutality. 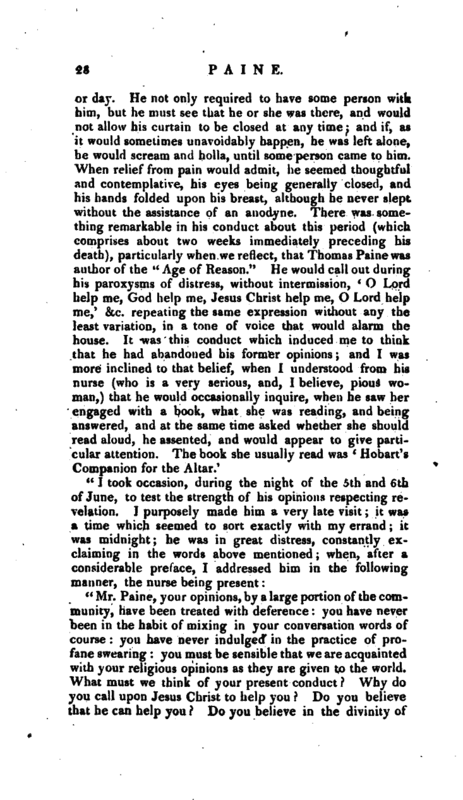 "Mr. Paine, your opinions, by a large portion of the community, have been treated with deference you have never been in the habit of mixing in your conversation words of course: you have never indulged in the practice of profane swearing: you must be sensible that we are acquainted with your religious opinions as they are given to the world. What must we think of your present conduct? Why do you call upon Jesus Christ to help you? Do you believe that he can help you? Do you believe in the divinity of | Jesns Christ? Come now, answer me honestly; I want an answer as from the lips of a dying man, for I verily believe that you will not live twenty-four hours/ I waited some time at the end of every question; he did not answer, but ceased to exclaim in the above manner. Again I addressed him c Mr. Paine, you have not answered my questions; will you answer them Allow me to ask again, do you believe or let me qualify the question, do you wish to believe that Jesus Christ is the son of God‘ After a pause of some minutes, he answered, ’ I have no wish to believe on that subject.’ I then left him, and know not whether he afterwards spoke to any person, on any subject, though he lived, as I before observed, till the morning of the 8th. 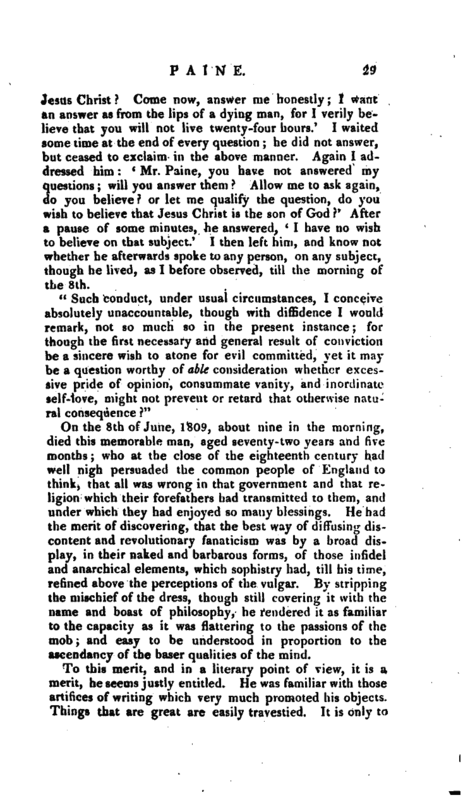 On the 8th of June, 1809, about nine in the morning, died this memorable man, aged seventy-two years and five months; who at the close of the eighteenth century had well nigh persuaded the common people of England to think> that all was wrong in that government and that religion which their forefathers had transmitted to them, and under which they had enjoyed so many blessings. He had the merit of discovering, that the best way of diffusing discontent and revolutionary fanaticism was by a broad display, in their naked and barbarous forms, of those infidel and anarchical elements, which sophistry had, till his time, refined above the perceptions of the vulgar. By stripping the mischief of the dress, though still covering it with the name and boast of philosophy, he rendered it as familiar to the capacity as it was flattering to the passions of the mob; and easy to be understood in proportion to the ascendancy of the baser qualities of the mind. To this merit, and in a literary point of view, it is a merit, he seems justly entitled. He was familiar with those artifices of writing which very much promoted his objects. Things that are great are easily travestied. It is only to | express them in a vulgar idiom, and incorporate them witfa low ideas. This is always very gratifying to the mean, the little, and the envious; and perhaps this was one of his most successful tricks upon the multitude. 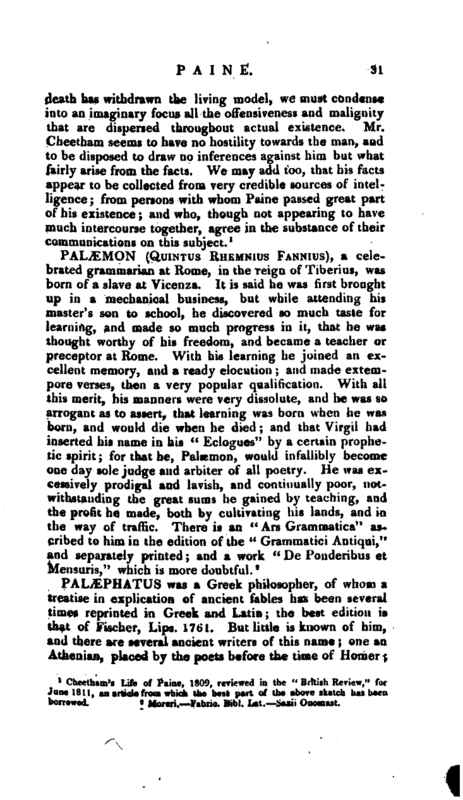 He had, besides, a sort of plebeian simplicity of style, almost bordering upon naivete", which clothed his imposture with the semblance of honesty; while the arrogance with which he treated great names was, with the base and contumelious, an argument, of his conscious pride and independence of thinking. What he calls “the principles of society, acting upon the nature and convluct of man,” are sufficient of themselves, according to his simple theory, to produce and perpetuate all the happiness and order of civilized life. Government is only imposition disguising oppression, and protecting wrongful accumulation. The dignity of human nature, in its lowest forms, is thus flattered by the discovery that the beggar and the felon have justice on their side while the one petitions for, aqd the other enforces, the restitution of his original rights. What hungry reprobate does not relish the proposition, that it is government which debauches the purity of our morals, and brings in passion over reason, by a sort of usurpation, to perplex the simplicity of God’s appointments? Philosophy must not be insulted by opposing her polished weapons to this? beggarly sophistry. There is one short and simple aphorism of common sense by which the whole of his theory is abundantly answered; and it is this, “Government is not made for men as they ought to be, but for men as they are; not for their possible perfection, but for their practical indigence.” This answer is co-extensive with the whole work of Mr. Paine upon the rights of man. It demolishes the whole fabric of his treacherous system. It dispels at once the clumsy fiction of his barbarous Utopia. 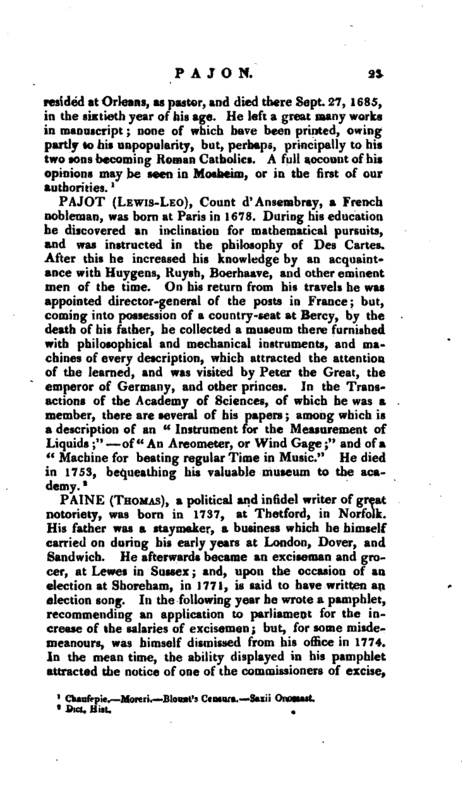 Cheetham’s Life of Paine, 1809, reviewed in the “British Review,” for June 1811, an article from which the best part of the above sketch has been borrowed.